Women’s self-employment and entrepreneurship are becoming more important worldwide by removing gender segregation and rising empowerment and income distributions of household in the society. "E-Chance" is a pilot project that supported new entrepreneurs with a diversified spectrum. Main aims are (i) activation of potential female founders with completed school education or professional education, who want to work in networks; (ii) creation of cooperations - the founders should also have the possibility to work in already existing networks of the mentors and the project partners or to initiate such networks; (iii) exchange of information between the associated countries for strengthening the regional economic structures. 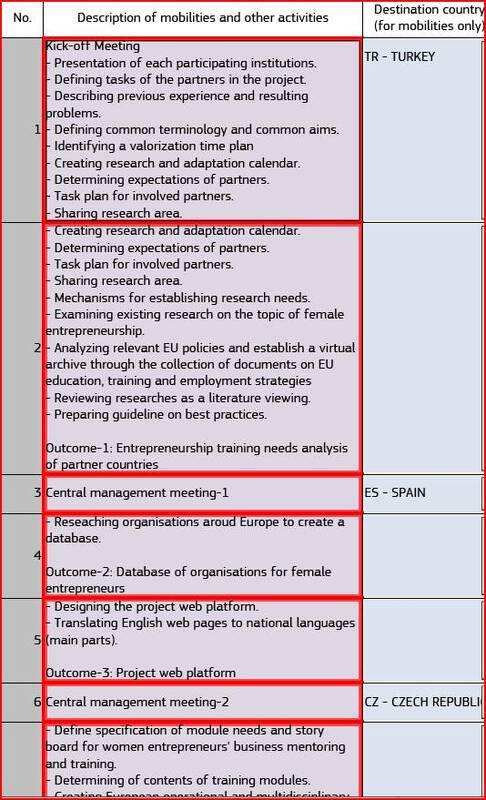 Project consortium will develop entrepreneurial training modules, methodical and social competencies of women during the project. Participation in the e-chance project will be cost-free and participants will make their time and knowledge available gratuitous. After identifying needs of entrepreneur, pilot courses will assist and support women in deciding on and implementing. The target group of the project are female entrepreneurs (especially unemployed women, women after a period of grace, women in economical problems) who want to work in networks and cooperation systems. For women in underdeveloped areas, the project also offer good chances for self employment. Project will provide business advice and support for women setting up in business, including business mentoring and entrepreneurial based business planning courses. As E-Chance consortium, we believe that lots of women could make business from their dreams and ideas. The project will help them successfully become self-employed or to start up and run their own business. “e-Chance” project has a mission to develop entrepreneurial women and to raise women's place in community. Main aims are; to (i) promote a dialogue on women's entrepreneurship, (ii) exchange experiences; (iii) promote e-learning and use of ICT, including especially e-commerce and creation of a cyber-market as well as disseminating role models of successful women entrepreneurs; (iv) facilitate the process of policy convergence based on best practices; (v) builds personal contacts and networks among related associations and individual entrepreneurs. (l) to provide services and advice relating to copyright, licensing, quality assurance, public-private partnerships and multilingualism. All partners will actively participate the project management, monitoring, evaluation and dissemination during 2 years. Coordinating institution, P1 (TR), will supervise the project, will plan tasks and activities of the partners, and will provide ICT service of the project as well as website of the project. P1 will prepare and combine entrepreneurship training needs analysis of partner countries (output-1). P2 will finalize the E-Chance training curricullum (output-4). - Database of organisations for female entrepreneurs (output-2). It will include organisation details and activities of related institutions around European countries. - Project web platform (output-3). This will be related to learning stories, project activities, news, links etc. It will also translate to partners national languages. - Evaluations/analysis reports of business mentoring and trainings (output-5). 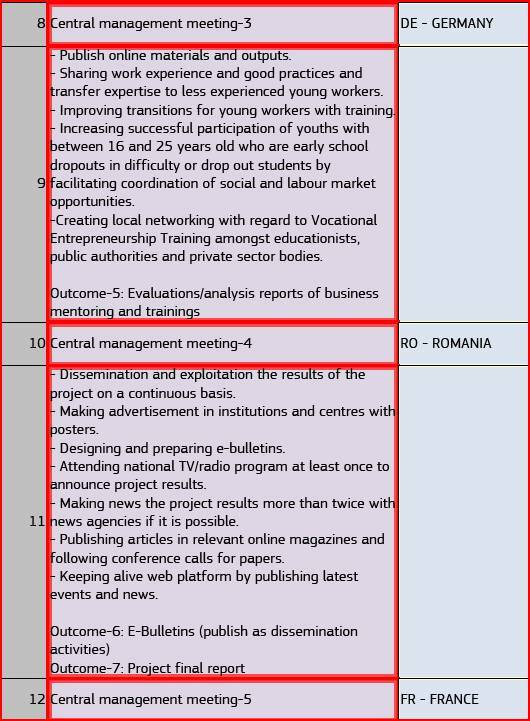 P6 (RO) will take care of prepared courses implementation to e-learning platform in an interactive and user friendly way, making sure contents are suitable for female entrepreneurs need as well as provide training material for various recreational programs as photo editing, sound editing etc. (output-4). P7 (BG) will publish e-bulletins at web sites and newspapers (output-6) as dissemination activities. Additionally, all the project participants will carry out at least two courses prepared in this project. Project final report will write by P0(TR) but all partners will help to finalize it. - Wider knowledge of the range of female entrepreneurs available and used across Europe which can help individuals build social capital and improve integration. - An increased knowledge of the impact that such tools can have on individuals. - Learning in how to deliver a range of female entrepreneurs' within the field of social and vocational integration. - Increased access to professional networks in the field of business services. - Increased exposure to people from different cultures, leading to greater understanding across social groups. - The ability to access a network of contacts (through web tools) who can provide advice and support on integration and life in their new country. - Increased confidence in taking an active involvement in their new community through their participation in the mentoring and trainings. E-Chance project has seven partners from Turkey, Czech Republic, France, Germany, Spain, Romania. Suleyman Sah University (P1, project coordinator) has extensive previous experience of running European projects for other organisations and is, therefore, aware of the skills needed to aid effective communication between transnational partners. The coordinator will manage a structured communication process which will emphasise trust, cooperation and the need for open and transparent communication between all partners. They will also ensure that all partners are aware of project deadlines and that these are realistic for all. A communication plan will be jointly developed and agreed upon at the beginning of the project, allowing partners to agree on the frequency, type and volume of communications which they expect from each other in order to facilitate open communication from the beginning. In between face to face meetings, partners will rely heavily on online communication tools, i.e. email, skype and online meetings as well as telephone conversations. There will also be an online space set up where partners can share documents and exchange information. All partners will be actively involved in the planning of each activity based on the knowledge gained from the ideas sharing and research stage of the project. Each will develop and implement their own pilot session for business mentoring and female entrepreneurship training aimed at the target group. Learners will take part in the pilot sessions and will then be involved in the evaluations in order to give their own opinion on the effectiveness of the method in building social and labor market integration and improving their ability to become better integrated within their community. They will also give feedback on any improvements that could be made. This feedback will be used to inform the final guide, which will be produced with input from staff and learners. Learners will also be involved in planning and implementing the web-based tool by providing input on the tools which would be most effective and useful for them. E-Chance project will be integrated into ongoing activities of the partner organisations as each partner is already an expert in the field of personal development interventions and are already involved in work with this target group through their organisations and are therefore involved in a number of projects and activities in this area. As a result, partners will ensure the integration of results from the project into other areas of their work, as they will be able to immediately transfer and apply any knowledge gained from the project. On a practical level, organisations will also look for synergies between this project and other ongoing activities in order to inform other work, both within their national contexts and across different partners in Europe. Also, partners will disseminate results and products from this project into other related projects across Europe, again ensuring integration within relevant project fields. At the beginning of the project all partners will discuss the aims and needs of their own organisation in relation to the project and a set of measures for success will be developed taking into account what each partner wishes to gain from their involvement. These measures of success will be revisited at the end of the project and evaluated in order to see if the project fulfilled these needs and expectations. After each meeting, the management of the partnership up to that point and the meeting itself will be evaluated in order to ensure that partners are satisfied with the cooperation between partners, balance of activity, knowledge sharing etc. The pilot sessions of business mentoring and entrepreneurial training will also be evaluated with both staff and learners in order to ensure they are useful and relevant to the needs of the project and the target group. Finally, at each stage of development of both the guide and web tools the work will be evaluated by staff and learners to ensure it is providing correct and necessary information and is user-friendly. The final products will be evaluated by distributing questionnaires via Survey Monkey to those individuals and organisations using them to judge their effectiveness. Project partner organizations will assist decision processes, internal and external communication, financial management, risk minimization, lead management in valorization activities. The project will have multiplier effect by aiming at innovative and effective ways of bringing Europe closer to citizens, of involving them in European citizenship and a process. Project should play a role in having citizens have their say in European project and should show how people can play their part in the European construction. Project will be enhanced effectiveness of public institutions’ and other stakeholders’ action by means of an integrated approach towards the objectives of sustainable development, fostering the synergies and coherence between different actors’ involvement. - to design a strategy of sustainability/dissemination of E-Chance project. - General dissemination plan (each partner institution will design a dissemination plan according with its networks and resources). - Special sessions (work shops, seminars). - Each partner will organize its country round tables discussion forums, debates for disseminating the outcomes. - Each partner will have the task to establish a list with national events for E-Chance dissemination (during the project). - The activities planned for the period after the end project will be included in the sustainability work plans.